Celeron de Bienville was a French military leader and explorer of Ohio in the mid-1700s. His 1749 expedition to the Ohio Country is one of the more memorable of the era. From 1744 until 1748, Britain and France were engaged in King George's War. During the conflict, Britain managed to blockade France's colonies in North America. 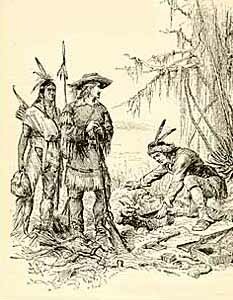 This greatly inhibited the French fur trade with the Native Americans of North America due to a lack of manufactured goods from Europe that could be exchanged for the natives' furs. British businessmen quickly stepped in to fill the void, becoming major trading partners with the Native Americans of the Ohio Country. At the war's conclusion, little changed in North America. The respective sides controlled the same territory as they had prior to the conflict. They also both claimed ownership of the Ohio Country. Britain had a somewhat greater presence in the region due to their improved ability to trade with the natives. In 1748, Comte de la Galissoniere, the highest-ranking French official in North America, ordered Celeron de Bienville (also spelled Celeron de Blainville) to take 250 French soldiers to the Ohio Country to renew old friendships with local Native Americans and to drive the British traders from the region. Pierre-Joseph Celeron de Bienville had been born in Montreal in 1693. He entered the military as a cadet at the age of thirteen and stayed with the army for the rest of his life. He was married for the first time in 1724 and was married a second time in 1743. He died in 1759 in Montreal. De Bienville carried out the mission in the summer of 1749. He made his way from Montreal by descending the Allegany River to the headwaters of the Ohio River (modern-day Pittsburgh), where he then proceeded down the Ohio. De Bienville carried several lead plates with him. On these plates were pronouncements laying claim to the Ohio Country. At the places where major rivers joined the Ohio, the party stopped and buried one of the tablets. On a nearby tree, a metal plaque was placed, asserting the claims of France and stating that the tablet lay nearby. This practice of burying plates first began in Europe in the Middle Ages and was a common way to show land ownership. In total, De Bienville is believed to have buried six plates. Only one has been found intact. The French soldiers proceeded from Pittsburgh to the Great Miami River, planting the plates as they went. Along the route, the soldiers encountered large numbers of British traders, especially at Lower Shawnee Town at the Scioto River's mouth. De Bienville demanded that the British leave, but most simply refused. Five months after his expedition began, the French commander returned to Montreal. He had failed to drive the British from the Ohio Country and to reestablish alliances with the natives. The French did not give up after De Bienville's expedition. French traders quickly moved into the region, hoping to recreate the favorable trading arrangements that they had enjoyed with the Ohio Country's Native Americans before King George's War. With both the French and British claiming the Ohio Country, future conflicts were inevitable. The French and Indian War (1756-1763) and the resulting Treaty of Paris (1763) would finally settle the issue. Due to its victory in the French and Indian War, Britain emerged from the conflict as the European owners of the Ohio Country. Many Native Americans in the region failed to acknowledge British ownership or control, and conflicts continued in the region for a number of years.